These Buffalo Chicken Bites are pleasantly spicy with just the right amount of heat. You can adjust the heat to your liking by using a hotter or more mild hot sauce in this recipe. 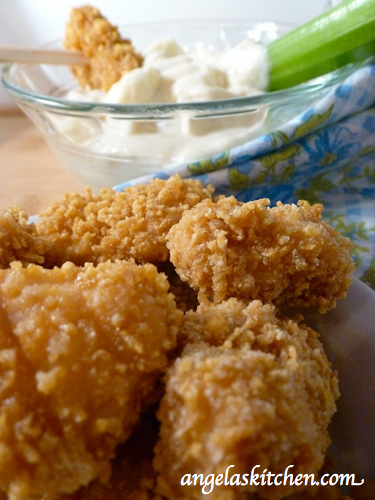 Most buffalo bites have the sauce on the outside, making the coating a soggy mess, but not so with this one! You get all the kick of a buffalo chicken bite with extra crunch and no sticky fingers (or couch, counter, etc.). Serve more hot sauce on the side for those who like things really spicy. 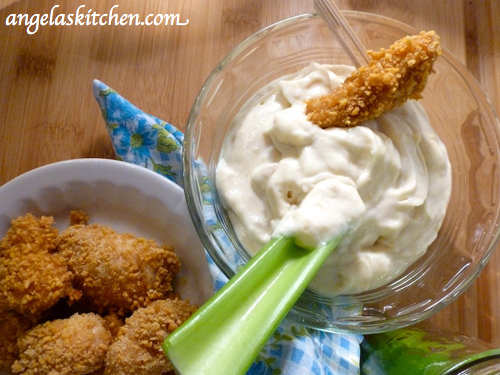 To cool things a bit serve the Buffalo Chicken Bites with celery sticks and Dairy Free Blue “Cheese” Dip. For the coating you could use any gluten free dairy free corn flakes as long as you pick one that is not very highly sweetened. However, I can tell you which one I prefer to use in this recipe: Erewhon Corn Flakes from Attune Foods. These flakes have a great crisp texture, uses US grown, organic non-GMO, and gluten free corn. The only ingredients are organic milled corn and sea salt. Love, love, love! And, in case you are wondering, I am not selling this cereal or being sponsored by Attune. I simply love their products. Oh, and for a wonderful gluten free panko bread crumb replacement, try crushing and using Erewhon Crispy Brown Rice Cereal. You can see it used in Gluten Free Dairy Free Chicken & Veggie Nuggets. Yum! Preheat oven to 425 degrees F. Place a wire cooling rack on a large baking sheet and spray lightly with gluten free oil spray or brush with olive oil. In a bowl whisk together hot sauce, oil, rice vinegar, garlic powder, and salt. 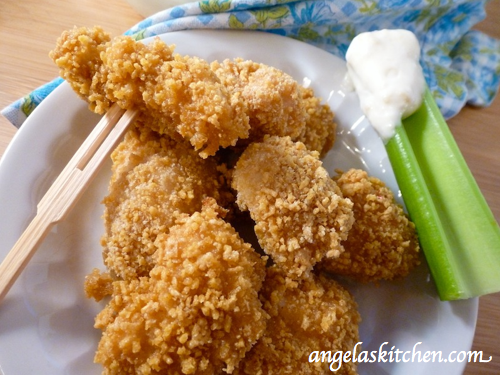 Cut chicken into one inch pieces. Add chicken pieces to hot sauce mixture and toss to coat. Put corn flakes into a large ziplock bag. Remove as much air as possible, seal bag, then crush cornflakes. Put crushed cornflakes into a shallow bowl. Add sweet rice flour and mix. Using a fork, toss the coated chicken a few pieces at a time until completely coated with cornflake mixture before placing on wire rack. After all the chicken is coated, bake at 425 degrees F for 12 minutes or until chicken bites are cooked through. Serve with celery sticks and Dairy Free Blue "Cheese" Dip. At least two hours before making dip, soak cashews in warm water. After soaking, drain cashews completely. Mix together mayonnaise, tahini, cider vinegar, lemon juice, salt and garlic powder. Put cashews and mayonnaise mixture into a food processor or blender (or use and immersion blender). Pulse dip until cashews are chopped into small pieces (like you would find in blue cheese drip) but not blended completely smooth. This is wonderful with Gluten Free Dairy Free Buffalo Chicken Bites and celery sticks. Yum! To use as a dressing: Add enough unsweetened gluten free dairy free milk substitute of choice until dressing is the thickness you desire. Enjoy!